Most of us regular Janes and Joes rely on a cup of coffee (or several) to power us up in order to get through day-to-day life. It is widely recognised that coffee has properties that wake us up and give us extra energy, but what you may not realise is just how useful your cup of coffee can be. In fact, the benefits of drinking coffee are so great that top athletes and sportspeople swear by a cup of coffee before their workouts to boost their performance. Weightlifters and endurance athletes, in particular, benefit from the strength and extra stamina provided by this super-beverage, and it is known to be one of the most effective pre-workout drinks. 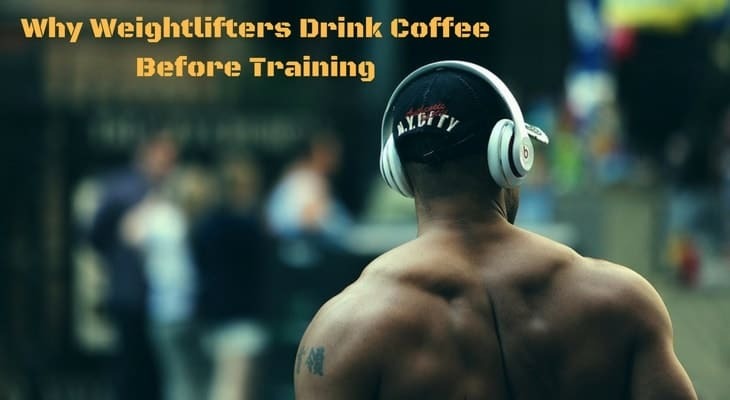 While I prefer to rely on my java to wake me up in the morning, or to help me finish some late-night writing, there is scientific evidence as to why coffee is the ideal drink to swig before a weightlifting session at the gym. So, let’s delve into how and why it works. First, and most obviously: coffee is chock-full of caffeine. A cup of regular, brewed coffee contains between 90 and 140 mg of caffeine, whereas a shot of espresso contains around 63 mg. In comparison, a 250 ml can of Red Bull has about 80 mg, while a 350 ml can of Coca-Cola has only 35 mg. In a nutshell, research published by the Australian Institute of Sport has found that one of the most important things caffeine does in your body is to stimulate your muscles to use fat cells instead of glycogen as an energy source. Let’s look at this in more detail: caffeine basically takes your fat molecules OUT of your fat stores and splits them into glycerol and fatty acids. The result of this is that there are loads of free fatty acids floating around in your bloodstream just dying to be used up (normally the body would use carbohydrates or lean muscle), which gives you that sense of energy. If that was all a bit confusing, let me break it down to one awesome sentence for you: coffee promotes fat burning. A review conducted in 2004 of 39 published studies (Doherty and Small) found that a cup of coffee consumed before exercise improved performance by 12.4% on average, and even a small amount of caffeine helped athletes to continue exercising almost a third longer than those who didn’t drink coffee at all.If that isn’t enough to convince you to put down the sports drink and pick up a pre-workout coffee, a study in the International Journal of Sport Nutrition and Exercise Metabolism found that trained athletes who consumed caffeine before exercising burned about 15% more calories for the next three hours. Caffeine does other wonderful things too. Because it is a stimulant, it raises the levels of adrenaline in the body and stimulates the central nervous system, which has the magical effect of increasing your pain threshold, meaning you can push yourself to do an extra round of reps or run those last few kilometres! This effect happens even in professional athletes and is excellent for endurance sports. Basically, it makes you push yourself harder for longer. To really reap the benefits for workouts, experts recommend that you save up your coffee allowance and only drink it pre-workout; this will optimise your performance and prevent you from building up a tolerance to caffeine. Now you may ask, “Well, why not just take a caffeine pill and skip the coffee?” This is a legitimate question – there are plenty of caffeine supplements on the market – but there is more to your cup of coffee than just the caffeine; with over 1000 different compounds found in coffee, there are countless positive health benefits to be found at the bottom of your mug. Coffee contains large concentrations of antioxidants, so much so that it is considered to be the biggest provider of antioxidants in the western world, where 79% of our antioxidants come from drinks, not food. Long story short, antioxidants fight disease and are our own personal cleaning crew, flushing harmful toxins out of the body. It improves circulation, meaning the delivery of much-needed oxygen to those hard-working, weight-lifting muscles is improved. Coffee is scientifically proven to reduce the rate of diabetes considerably (coffee drinkers have a 23-50% lower risk of developing type 2 diabetes). It also lowers the risk of colon cancer, strokes, Alzheimer’s disease, Parkinson’s disease, heart disease, liver cirrhosis, gallstones, and some cancers. On top of these things, coffee can act as an appetite suppressant, improve focus, and help to alleviate some of the muscle damage and other effects that come with ageing. Now, this is all great news for both weightlifters and coffee lovers, but bear in mind that you can have too much of a good thing. Caffeine, and therefore coffee, is addictive, and if consumed in high doses it can increase the level of cortisol in the body, which is basically the hormone that encourages the body to go ahead and store fat. If too much is ingested it can also cause shakiness, high blood pressure, elevated heart rate, and agitation. Experts recommend that the maximum amount of caffeine for enhancing performance during a workout, without those nasty side effects, is up to 6 mg/kg of body weight; so, for a 70 kg man you’d be looking at about 420 mg. However, people have varied tolerances to coffee, so if you’re not a regular drinker, a good starting point would be 2-3 mg/kg of bodyweight, about an hour before exercise. With all this positive news about coffee, don’t go running off to buy yourself a large cream-filled, sugar-laced cup, with caramel syrup on the top! As with all things, moderation is the key, and if you’re planning on using coffee as an exercise and weight-loss aid, stick to a cup of pure black coffee before a workout, and save the fancy stuff for an occasional treat.